The segregation is one of the three key issues facing those that handle powders. It is responsible for unscheduled downtimes due to quality issues. The mitigation of segregation is a primary objective when handling mixtures and blends. Segregation is a mechanistic phenomenon. Particle is dislodged and air currents carry fine particles down a pile where they deposit near equipment walls. The fines usually end up at the bottom of the pile – a very different segregation profile than sifting segregation. 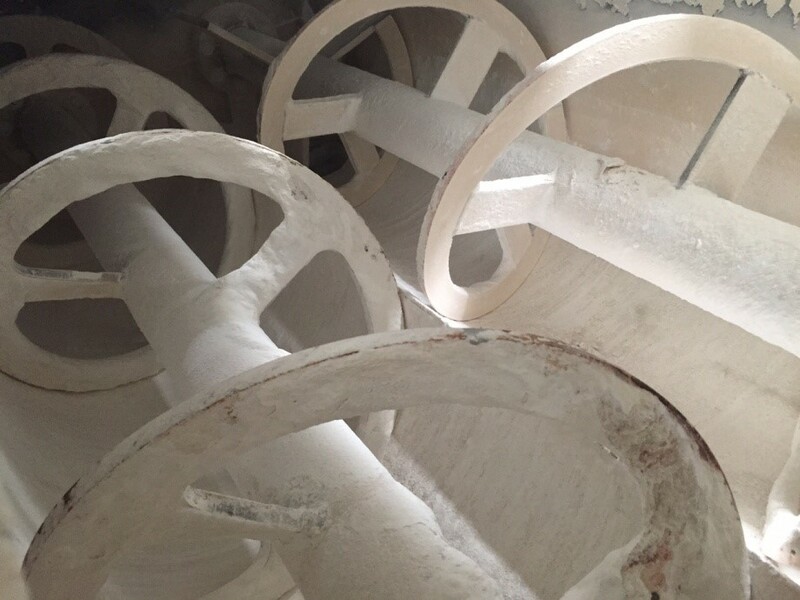 In some cases fluidization of powder can result in a classification of particles within a column of bulk solid, creating a top-to-bottom segregation profile with the fines at the top. A prescribed material blend may be subject to one or all of these phenomena. To solve a segregation problem in a plant, one must understand the magnitude of the segregation (segregation intensity), the unique segregation pattern, and the root causes of segregation. Evaluations such as segregation potential tests, PSD analysis, angle of repose measurements, and true density tests, can be performed that quantify the segregation pattern, magnitude, and segregation mechanisms. It is possible with this information to determine how much of what component in a blend is segregating by which mechanism. It is important to measure the segregation intensity on a component – by -component basis. Segregation intensity is a standard deviation relative to the mean concentration of segregation potential test data. It is always measured for each component in the mix. You may find that one component has very low segregation intensity values, while other components in the mix has significantly higher values. Equally important is a measure of the segregation pattern on a component-by-component basis. You want to know where in the process equipment each component may end up. This is generally done by plotting the segregation concentration profile measured from a segregation potential test as a function of some spatial dimension. This could be a plot of component concentrations down a pile or component concentrations as a function of depth of material. Test techniques exist that allow the user to get this information. If segregation intensity numbers are large, then the segregation pattern information helps an engineer design feed systems with the right velocity profiles or draw-down sequences to remix segregated materials during operation or discharge. Sometimes the engineer wants to know what type of blender or equipment will best handle a material sensitive to segregation. In this case, understanding the cause(s) of segregation becomes important to determine which equipment may induce significant separation of material during operation. If a material is very sensitive to repose angle segregation, then a blender that blend predominantly by forming piles may be a poor choice, while a blender that operates without forming piles may be a better choice. provides formulators the ability to design a material that will not segregation in the first place. If one can quantify the causes behind segregation on a component-by-component basis, then one can modify a particle scale characteristic to charge the root cause of segregation and design materials with minimal segregation tendencies. Thus, to effectively solve segregation problems, one must know the segregation magnitude, segregation pattern, and segregation mechanisms on a component-by-component basis.